Crisp and light, with a crackly brown crust, these baguettes are super-easy to make. 3 hrs 10 mins. to 4 hrs 50 mins. Stir in the salt, sugar, yeast and gluten, then an additional 1 1/2 to 2 cups of flour. Stir until the dough pulls away from the sides of the bowl, adding only enough additional flour as necessary; a slack (sticky) dough makes a light loaf. Knead the dough for about 7 minutes in a stand mixer; or 8 to 10 minutes by hand, on a lightly greased work surface. You may also knead this dough using the dough cycle on your bread machine; once it's finished kneading, transfer it to a bowl to rise, as directed below. Turn the dough into an oiled bowl, cover the bowl, and let the dough rise until doubled in bulk, about 90 minutes. Gently deflate the dough, and divide it into six pieces (for thin baguettes) or three pieces (for thicker Italian loaves). Shape each piece into a 16" long loaf, and place the loaves, at least 4" apart, on parchment-lined baking sheets, or in lightly greased baguette pans (French loaf pans). If you're using baguette pans, make the loaves 15" long. Cover the loaves with lightly greased plastic wrap, and let them rise for 1 1/2 to 2 hours, or until they're nice and puffy. Towards the end of the rising time, preheat your oven to 450°F. For a classic look, make three diagonal slashes in each loaf, cutting about 1/4" deep. For taller, rounder baguettes, don't slash. Bake the baguettes for about 25 minutes, or until they're a rich golden brown. If you baked in baguette pans, remove the loaves from the oven and unmold. Turn off the oven, return the loaves (without the pan) to the oven, and crack the oven door open a few inches. If you baked on a parchment-lined baking sheet, simply turn off the oven and crack the oven door open a few inches. Letting the loaves cool right in the turned-off oven helps preserve their crunchy crust. Remove the baguettes from the oven, and cool them completely on a rack. Store any leftovers in a paper bag for a day or so; paper will preserve their crunchy crust better than plastic. Freeze for longer storage. 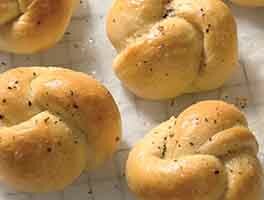 The more yeast you use (and the more vigorous your starter), the faster your dough will rise. But speed can come at the expense of flavor; it's only over time that sourdough dough produces the lactic and acetic acids so critical to its taste. 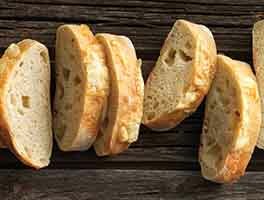 For the most pronounced flavor, you can try eliminating the packaged yeast entirely, understanding that your rising times will probably be considerably longer than those listed here. We suggest, if you feel your starter is nice and vigorous, to try making the bread with 1 teaspoon of yeast; and if you like those results and are willing to experiment, dropping the amount of yeast down until you reach your favorite combination of flavor and rising times. If you feed your sourdough before using, the loaves will rise better; but if you're in a hurry, unfed sourdough will simply lend its flavor, while the yeast in the recipe takes care of the rise. Want to make just three baguettes instead of six? Cut all of the ingredients except the yeast in half, leaving the yeast at 1 teaspoon. Three baguettes bake up beautifully in our baguette baker. They'll need to bake for about 25 minutes with the cover on and another 5 to 10 minutes after you remove the cover. 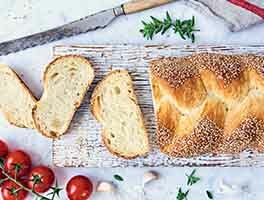 If desired, brush risen loaves with 1 egg yolk lightly beaten with 1 tablespoon water just before baking, and sprinkle with Pizza Seasoning, artisan bread topping, or the toppings of your choice. 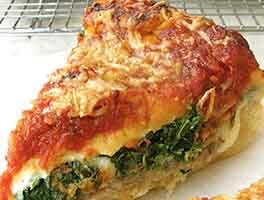 While totally untraditional, this does add flavor and color to the crust. Hi -- Great recipe, I'm now using a bit more fully-ripe starter, and no yeast, and let the ball of dough sit overnight in the fridge (or all day) before shaping and proofing. Great taste, pretty crumb, bit more of a sourdough tang! Btw, I must say that you really should change the photo or the recipe -- the recipe says "For a classic look, make three diagonal slashes in each loaf . . .", but the photo shows six slashes. Delicious -- wonderful sourdough fragrance while baking, great color without adding any glaze and tasted great. I will cut the recipe in half for the next round -- 6 baguettes is alot for us, and baguettes are best fresh baked. I tried this recipe twice: 1. Replaced 15% of AP flour with white whole wheat flour. 2 replaced 15% of AP with barley flour and no yeast. Both turned out with similar structure though it took longer to rise as expected. The crusts were excellent in both cases. The structures ware less airy than I liked in both cases - did not turned out like the KA photo of the recipe :-). Nevertheless, it's a great recipe and I will continue to experiment with it. My mother-in-law called to say she is cooking chicken curry for new year's day lunch. Ooh, perfect to pair it with baguette. I took the opportunity to try this recipe as I have been dying to use my discards. The dough was quite slack plus I am still learning to shape, I struggled with the dough. I had KAF video in front of me and that helped but still the dough was not evenly rolled out. I also had trouble slashing the dough. My blade kept getting caught and dragging the skin instead of slashing. In the end I used scissors and the end result looked decent. I used my steam oven to bake at 30% steam. The bread was yummy and crusty. Will definitely try again to do it better. Thanks KAF for the recipe. It bought smiles around the lunch table! Dear KAF - I bake a lot. Maybe it's my fault but 25 minutes and these loaves were BURNT. Dag nab it - been at it for many many hours and I thought they looked done as I walked by at like 18 minutes but because my oven runs low (per my manual thermometer in my oven) I left them and said to myself - KAF knows what they are doing... I'm so disappointed... all the time and the ingredients... You need to reduce the baking time to about 20 min for future bakers. Just perfecting my sourdough skills and having a ball doing it. 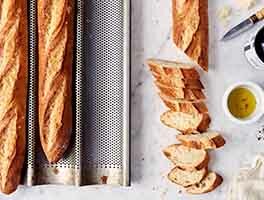 I wish the recipe had a link to shaping baguettes. I saw KAFs video after I had baked mine and realized there was something missing. They are cooling and smell wonderful. Next time I'll use the shaping technique ! I received the KAF starter 4 days ago and have religiously fed it as directed and it's been very active. So I was excited to begin making the baguettes this morning. I started the recipe and realized I didn't have the vital wheat gluten so I used half AP and half bread flour (both King Arthur brand). I also added 1 teaspoon of the KAF citric acid since my husband & I both love a heavy sourdough tang. I wasn't sure how "slack" the dough should be so I may have left it too slack because I had to coat both hands with olive oil to keep the dough from sticking while forming the baguettes. I opted for the 3 larger baguettes and placed 2 in a metal baguette pan and left one baguette without a pan but bolstered it's sides with a stiff bakers' cloth. All baguettes were covered with saran wrap that I had sprayed with Pam. The second rise took about 1 hour 45 minutes and the baguettes in the pan had a nice rise but the single baguette flattened out when the cloth was moved. I slashed the tops of all 3 baguettes but the slashed area closed right back and never expanded. The oven was 450 when I put the bread in and I added ice to a hot iron skillet sitting on the oven floor. I baked for 25 minutes and cooled in the oven as directed. Unfortunately, the single baguette ended up like ciabatta and all baguettes were very pale and have no large holes. They aren't pretty but the taste is absolutely wonderful so I'm determined to try again! Can you help me with my shortcomings? 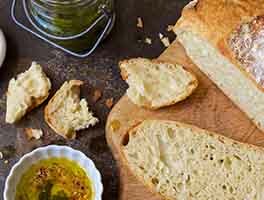 Thank you for this great tasting recipe and any help you may give in my search for a "better than store bought" baguette! Wonderful! They taste just as they should. The only errors were mine! My kitchen is warmer than I thought and it more than doubled. Maybe that's why there are no big holes in the loaves? They taste just right but now I need to learn how to shape baguettes instead of the oblong loaves.